Three layers of blooms in varying shades of pink will quickly mature into a sophisticated living bouquet. Delicate pink-tinted Chionodoxa flowers float around the rim of our classic blonde basket and will soon be joined by jumbo hyacinths with enough perfume to fill a room. 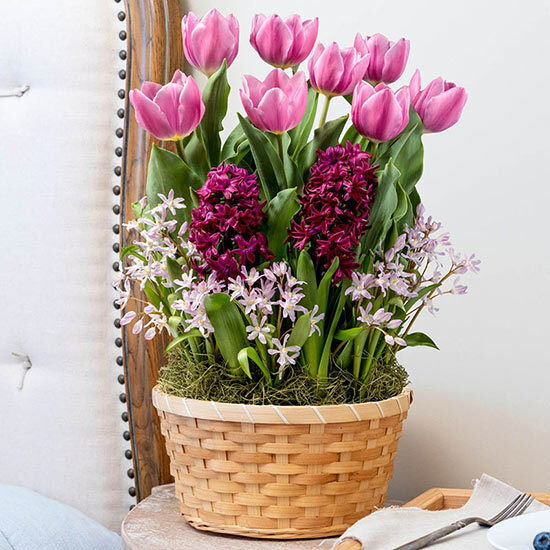 Eight Synaeda Amor tulips top this extravagant display that's perfect for Easter, Mother's Day or a special spring birthday. Includes 22 bulbs total. (8" dia.) EXCLUSIVE.